We know the focus on wedding day shopping usually leans towards the bride and her search for the perfect gown, but it’s just as vital that the groom looks and feels his best on the big day. But while there’s plenty of information and advice on how to find the dream dress, it can be harder for grooms to know where to start. First off, there are a few key points you need to consider that will help to guide your decision. 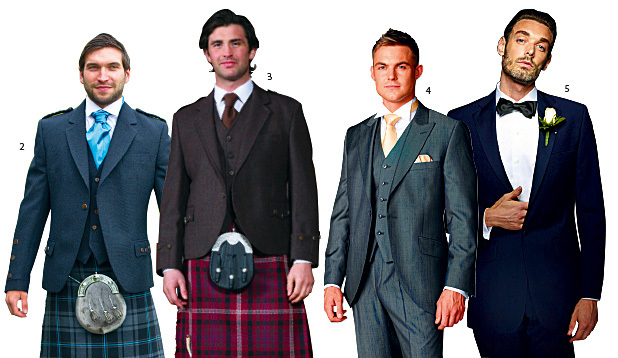 Perhaps the most important is deciding whether you want to wear a traditional kilt outfit or a classic suit. Alasdair Macleod of Geoffrey (Tailor) Kiltmakers explains why you might opt for Highlandwear. “Even if you’re not used to wearing the kilt, it looks great in photos, adds a sense of occasion, and is surprisingly comfortable,” he says. If you’re gravitating towards the idea of a kilt, the first thing you need to consider is the tartan. You may already have your own kilt and have decided to wear it with a new jacket to give it a different feel for the day, but remember you’ve got a best man and ushers to dress too. One increasingly popular trend sees grooms asking their ushers to wear their own kilts too, even if they’re a mixture of tartans, to create a colourful, eclectic look. Hiring matching jackets for each of the groomsmen will give this look some unity. Just check in plenty of time that all your friends do actually have kilts! If you don’t have your own kilt or you just want to wear something a little bit different on the big day, there is a multitude of tartans to choose from. 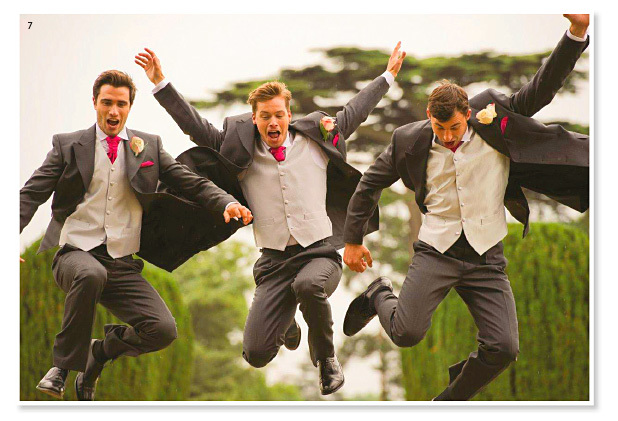 Some stores specialise in kitting out the groomsmen – head there to buy or hire their outfits. Listen to the advice of the experts in these shops – they are well placed to help you decide between a traditional Prince Charlie jacket with matching waistcoat or a more modern style. At this point, it might be a good idea to get some guidance from your bride and make sure that whatever you’re planning to wear down the aisle will sit nicely beside her dress. “I would advise the groom to liaise with the bride regarding colour and style, and whether they want a traditional Scottish look or a more contemporary look,” says Fiona Stewart of Stewart Highland. The bride might be able to help you out with colour swatches too, so you can check that your tartan won’t clash with her beautiful bridesmaid dresses. This idea can work for grooms wearing suits too, with a matching tie, a colourful handkerchief poking out of the top pocket and some jazzy cufflinks or even socks adding a matching splash of colour to tie together the look of the whole bridal party. However, as Ross MacKay points out, you might want to opt for an alternative colour: “The groom can match the bridesmaids, but he may wish to wear an alternative colour so that he stands out from the rest of the wedding party. Whether you’re going to hire, buy or even get a bespoke outfit made up, it’s always important to give yourself plenty of time to do your research and try on a few different styles before making the final decision. “Start looking at least four to five months before the date – and for a kilt outfit, make sure you order at least three months before the day,” recommends Alasdair Macleod. Most of all, make sure that the outfit you choose is something you like and feel comfortable in – the last thing you want to be worrying about as your beautiful bride walks down the aisle is a jacket that doesn’t fit properly or shoes that chafe at the heel. “Select an outfit that you’ll feel as good in as the bride does in her dress – it’s your big day too!” recommends Fiona Stewart. The kilt is given a modern edge at this Edinburgh boutique, where owner Howie Nicholsby is expert at creating bespoke outfits. Competitive hire packages are available at this store in Stirling, with made-to-measure kilts on offer, too. With stores in Edinburgh, Glasgow and Oban, its team are on hand to help you choose your outfit. As well as a wide selection of tartans, the Kilt Hire Company has all the accessories you might need. Hire or buy your kilt outfit from one of the Glasgow or Ayrshire stores. Create your perfect hire outfit online at McCalls, which also sells the unusual Pride of Scotland tartan. The team at this West Calder store have been hand-making kilts for 60 years. Renowned for offering more contemporary looks, Slanj Kilts have stores in both Edinburgh and Glasgow. 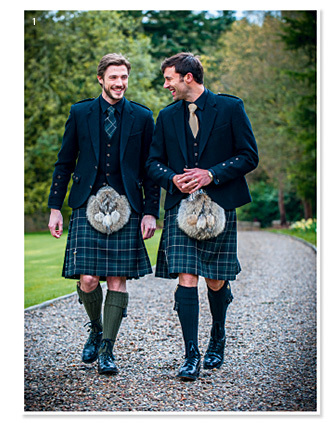 With stores across the country, Slaters is a popular choice for hiring or buying your suit or kilt outfit. Customer service at this family-run business is top notch, and there’s a stunning range of kiltwear to buy or hire. Specialising in engraving, this store provides great personalised presents.